Should Kevin Smith Work With Ben Affleck On Batman? Since Ben Affleck was announced as the new Batman last Thursday, we've been talking about it… a lot. But before we leave the topic behind and go back to speculating about the rest of the superhero universe, we had to deal with the wild suggestion that Sean made to the entire staff a few days back. 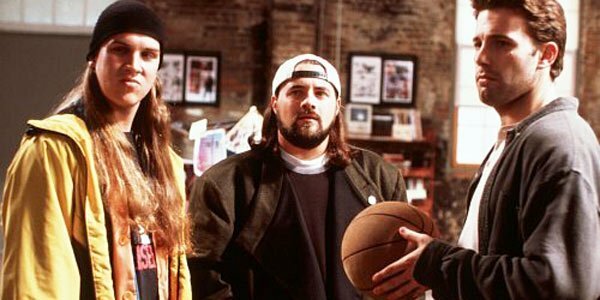 Now that Ben Affleck is Batman… he should bring his old buddy Kevin Smith along with him. Sean stands by it, and Katey debated him to figure out what the hell he was thinking. Check out the Great Debate below! SEAN: Katey, the biggest story of last week, and possibly of the year to date, is the casting of Ben Affleck as Batman in Zack Snyder's as-yet-untitled Batman vs. Superman movie. And obviously, when you drop a "stone" of this size into a metaphorical "pond," it sends ripples. So many questions need to be answered in light of this casting. Why would this established director backpedal to the realm of superhero blockbusters when his last foray ended horribly? How much screen time will Affleck actually get as The Batman? And how can we prevent Snyder's sequel from disappointing, a la Man of Steel. I made a suggestion, which you found so ridiculous, we had to debate. I suggested that Affleck recruit his close friend and former colleague Kevin Smith to help guide this production. Before you tear me a new one, let me explain. KATEY: Start talkin', O'Connell, because I need answers! SEAN: Smith, obviously, is known for his stoner comedies, Clerks and Mallrats and the like. He and Affleck have a rich history. The actor carried what Smith probably still feels is his best film, Chasing Amy, and also co-starred in Dogma, Jay & Silent Bob Strike Back and other efforts. They are friends, and former collaborators. But Smith ALSO is a renowned Batman fanatic. He has been writing Batman comics for years. His story arc, Batman: Cacophony was packaged into a trade paperback that spent weeks on the New York Times Bestseller list. He hosts a respected weekly podcast titled "Fatman on Batman." Smith, if nothing else, knows the character of Batman inside and out. In addition, he knows how to write for Affleck. I think bringing Smith on board the project in a small role -- consultant, co-writer ... something -- can really help Snyder figure out how best to use this new Batman. But you are vehemently opposed. Tell me why. KATEY: Well, I'm vehemently opposed to Smith in general-- I loved him so hard when I was in high school (like lots of people) and then just completely turned on him around the time I had to unfollow him on Twitter. So part of this is just me getting over my general distaste for him personally at this point-- which I admit, is not a valid reason to want him to work on a Batman movie! But your argument for bringing him in seems to boil down to two things. 1) He and Affleck know each other and are theoretically still cordial, though I bet Affleck unfollowed him on Twitter too. And 2) Smith is a big Batman fan. But I'm not seeing any argument that says Smith as a filmmaker, or as a storyteller, should have a hand in this. SEAN: My argument leans more toward point No. 2, and it goes beyond Smith being a "fan." I think that his experience writing for DC Comics, and writing for Batman specifically, can help correct several of the mistakes that Warner has made with Batman in recent years ... specifically the way that the hero was treated in The Dark Knight Rises. If you listen to Smith's "Batman" podcasts -- and if you are a Batman fan, they are a must -- you learn a lot about the character, the motivations, the legacy of the series and the history of the hero. I have been surprised by Smith's deep Batman knowledge, and he often catches me off guard on a podcast by bringing up elements about Batman and the past Batman films (going back to Burton and Schumacher) that could have worked better with simple changes. SEAN: Now, of course, everyone is an armchair quarterback in this day and age. But Smith genuinely seems to care about the DC universe. His Batman comics have been well-received by fans. His critiques of Nolan's TDKR are extremely valid (and the mistakes he points out are simple, basic Batman characteristics which anyone with passing knowledge of the character wouldn't make). Given how far off the rails Rises flew, I think it would be comforting to have someone with past Batman writing experience in the writer's room simply saying, "Wait, Batman wouldn't retire from crimefighting for nine years just because his girlfriend died. The dude watched his parents die. If anything, Batman would grow more committed to fighting crime in the wake of his girlfriend's death. You guys should know that." The fact that Smith wrote dialogue for Affleck on multiple films is merely a cherry on top. I would have recommended SMith for Script Doctor on any Batman project moving forward. The dude knows his Dark Knight. Having Affleck in the suit only makes it a no-brainer .... to me, anyway. Still not convinced? KATEY: You make good points, and not having read the Smith comics I just have to go with your word on it that he did right by the character. But it's the "Batman wouldn't do this" part that bugs me. Batman leaving Gotham for 8 years before his girlfriend died was kind of silly, but that's because TDKR didn't sell it to me, not because Batman "wouldn't" do that. Superhero movies are not how a superhero ought to behave based on 80 years of comics... it's based on what the movies themselves tell us. The thing I worry about in any case when a superfan takes over a property-- and that includes Snyder's Watchmen-- is that they stay way too devoted to the legacy of the comics to bring anything new and to make sense out of it cinematically. If anything, I'd argue a major problem with Man of Steel is that they were too obsessed with Superman's legacy and getting away from it-- hence that ending that drove everybody crazy. KATEY: Doesn't David S. Goyer qualify as that expert though? And he has the added bonus of actually having written a good movie in the last decade? I grant that they could probably use some fresh blood in the room, but Smith is so, so far down on the list of people I'd want in there. Plus, isn't he all about being an outsider these days anyway? Signing on to a giant superhero film would betray all the ways he said he was totally done with Hollywood like three years ago. SEAN: The Goyer issue is something entirely different. I'm not sure how that dude can sleep at night knowing that he now has to reinvent the hero he put out to pasture. True, Goyer didn't write TDKR, but he and Nolan take credit/blame for "retiring" the not-dead Bruce Wayne. Now Goyer has to dig in to a different Bruce Wayne, with completely different motivations, and give us something equally brilliant ... if not better! "Katey, I love this story you wrote. Really, it's perfect. It might win you a Pulitzer. Now, can you write the same story, but differently? And make it better. Thanks!" Fresh blood is crucial. I wouldn't have Goyer anywhere near this movie. Then again, I wouldn't have Snyder, either, but what do I know? KATEY: Yeah, we're maybe avoiding the elephant in the room, which is Snyder directing the whole thing to begin with. Adding in a consultant to treat the character better would basically be like putting a band-aid on a wound... but Smith is soooooo not that band-aid to me. SEAN: I understand your hesitation. I really do. I'm not even a big Smith fan, and I feel strange cheerleading him so. All I'm saying is that the director of Elf doesn't strike me as the right choice for Iron Man, and the director of Firefly shouldn't have been handed the keys to The Avengers. But Marvel has taken ballsy chances, and it has paid off. Warner/DC should take one. It can't get worse than Man of Steel. Right? KATEY: And with that, Sean, you have invited the entire Internet to spend the week yelling at you-- and Kevin Smith's many fans to yell at me. I guess we can take some of the pressure off Affleck, at least. SEAN: It's the cross we bear, Katey. Should Kevin Smith get involved with new Batman movies?